It is of interest to note that while a geographical cross-section of speakers agreed on the urgent need to protect humanity from exposures to all types of asbestos, the sole voices of dissent were from a handful of vested interests, with Russian stakeholders leading the pack. asbestos removal is both difficult and expensive. Describing the research conducted on asbestos by IARC, Dr. Kurt Straif stated that since 1987 all forms of asbestos had been classified as carcinogenic to humans. In 1998, the WHO confirmed this classification in its publication: Environmental Health Criteria 203 Chrysotile Asbestos. There is, Straif said, absolutely no doubt that occupational and environmental exposure to all asbestos can cause mesothelioma, lung cancer and asbestosis; evidence has also linked exposure to asbestos to laryngeal cancer. 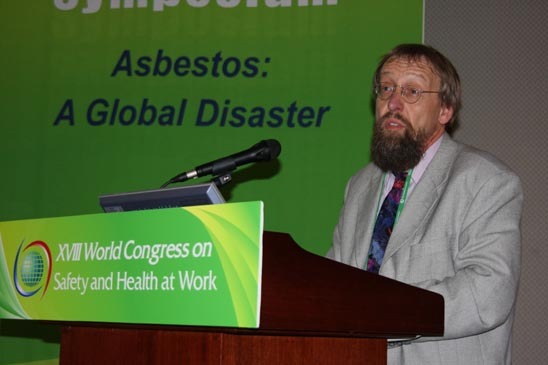 Referencing the devastation asbestos has caused in industrial countries, he warned of a second, even bigger wave of the global asbestos disaster which will hit developing countries in years to come. Work on quantifying the fallout from decades of heavy asbestos use in Asia was discussed by Dr. Ken Takahashi (Japan) who presented epidemiological data that demonstrated a clear ecologic relation between mortality rates of four asbestos disease categories and historical asbestos use in 1960-1969. Takahashi stressed the need to ban asbestos in order to reduce disease levels. This step has been taken by the Government of Korea which plans to prohibit all asbestos use in 2009, decades after commercial exploitation of asbestos first began. 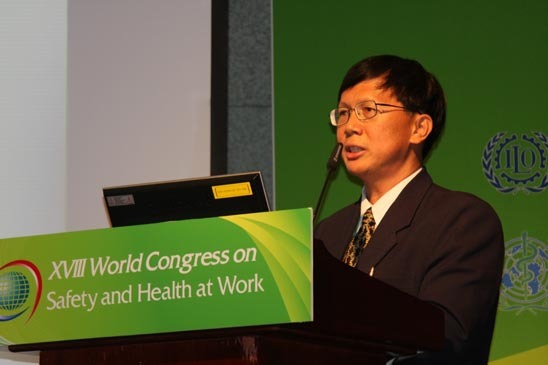 In his presentation, Dr. Domyung Paek outlined the development of the Korean asbestos industry and its impact on workers and local people. Following ILO and WHO recommendations, the Government of Thailand is implementing a national strategy to tackle the asbestos problem by imposing strict controls in the run-up to an all out ban by 2013. A similar plan is being put into place in Vietnam according to Tran Thi Ngoc Lan from the Ministry of Health who highlighted the risk to public health posed by asbestos-contaminated consumer goods. Construction workers are another category at high-risk of contracting asbestos-related disease. Seok Keun Baik, from the Korean Construction Workers Union, discussed the case of Lee Jae Bin, a Korean construction worker who is suffering from asbestos-related cancer; Bin received no asbestos awareness training, no protective clothing or safety equipment from his employers. After a year of protests, aggressive lobbying by the union and a media campaign, the Government still refuses to recognize Bin's cancer as an occupational disease. 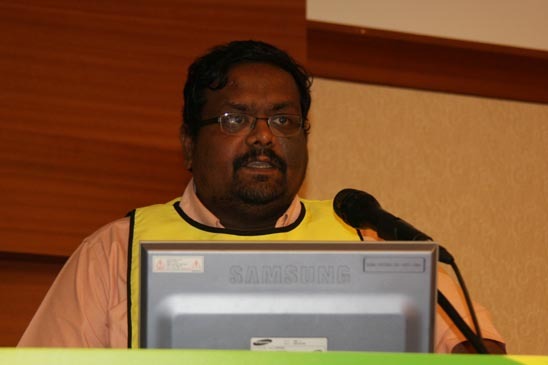 Other actions by construction trade unions to raise asbestos awareness were discussed in presentations by Gerard Seno, Vipul Pandya and Karnan Ramamurthy, members of the Building and Woodworkers International (BWI) from the Philippines and India. Since 1989, the BWI has advocated a global ban on the use of all types of asbestos. 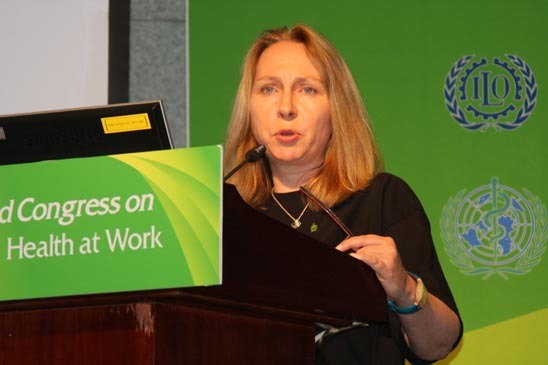 In her presentations Fiona Murie, BWI's Director of Health, Safety and Environment, expressed BWI support for the positions on asbestos taken by the WHO, ILO, IARC and ISSA. There was, she said, no such thing as the safe or controlled use of asbestos. To support this statement, Ms. Murie showed photographs of the chaos and bad practices typical on construction sites throughout the developing world. Contrasting Killing the Future  Asbestos Use in Asia4 and Chrysotile Asbestos Saves Lives,5 documents being distributed in Seoul, Ms. Murie said that the propaganda which was to be found in the later publication was part and parcel of industry's efforts to sow confusion and doubt where none existed: chrysotile is dangerous and should be banned. 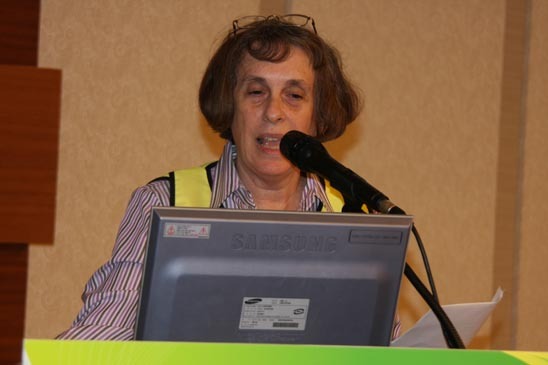 The plight of asbestos victims was the focus of the remarks made by Laurie Kazan-Allen from the International Ban Asbestos Secretariat (IBAS). The day after this cri de coeur was read out, Aldo died. 1 Kazan-Allen L. The Times They Are A-Changing. IBAS website. 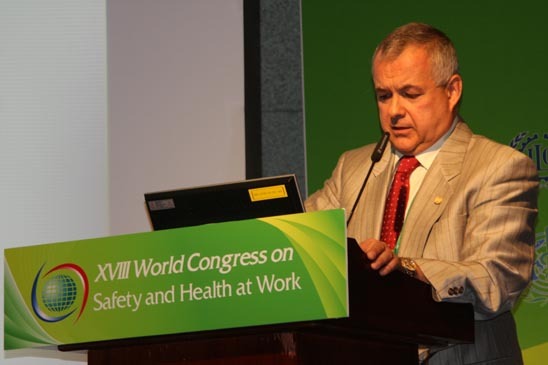 4 Kazan-Allen L. Killing the Future  Asbestos Use in Asia. International Ban Asbestos Secretariat, 2007. 5 Anonymous. Chrysotile Asbestos Saves Lives. International Alliance of Trade Unions Chrysotile, 2007. 6 For more information on the asbestos lobby's shenanigens in Seoul, see: "Defending the Indefensible". IBAS website.